Ron smirked heavily but Dr. Benson Spicer remained cool. In his tweed jacket, his perfect posture could cut diamonds, and in his close-cut coif of gray-sprinkled hair, he stood ready to take off for the stars. In his arms his robot Copper — toaster sized and studded with Christmas tree lights – spun its wire limbs. “This is success?” Ron gestured expansively to the studio walls cracked with multiple layers of faux wood. A third-place award for best local station hung askew by the control booth’s window, where Grace, the Parma Community College intern, sat in her ‘PCC’s the Pits’ t-shirt and guzzled from an unmarked bottle. Benson gave his lie-detecting cohost a stern look. Copper innocently spun its arms. Ron stood up and conceded his spot with a mock bow. Benson acknowledged the bow and occupied the swivel chair throne. Copper’s tin-speaker blared triumphant mariachi music. Ron hissed and hooted as he grabbed his coat and headed for the door. “… a pro like you can figure it out.” And Ron was out the creaking studio door. Benson opened his show outline and reread the portions that weren’t doodles of rockets or 80s song lyrics. The margins overflowed with notes, condensing his lecturing experience and psychology PhD into talking points for sobbing callers. He patted Copper’s side, hummed the last bars of the fading commercial for Mabel’s Country Kitchen: home of the roadkill special, and leaned into the microphone. Benson pulled up the pending call line on his monitor. All twelve slots remained empty. So did the “next track” line. He threw a fistful of pencils at the control booth’s window before Grace startled awake, took a swig, and plugged in a tune. Benson pulled Copper closer as ultra-smooth R&B pipes filled his headphones. He flipped open Copper’s back panel and fiddled with the interface. His effort was met with mariachi music. Benson sat up straight in surprise. He’d never known Grace to use the intercom, or do anything beyond load songs and choke down bags of potato chips. Grace guffawed out potato chip particles. Benson raised his head high and waited as the last “Looovvve” drifted like velvet across the airwaves. Benson’s monitor flashed a roulette of waiting callers, and no amount of refreshes or adjustments exterminated the digital ants crawling the interface. Benson randomly selected line three and a ‘Kth Ornsthoon’ jumped onto the active call. Benson slammed the dump button. Plenty of delay time remained. Meanwhile, Copper was trying to tip off the stool. Benson steadied his spinning companion and selected another number. A chaos of consonants splayed across the active call field. He didn’t attempt a pronunciation. The crackling line went static-free as the caller intoned in a hollow whisper. Benson dumped out again and hung his head. A little under a minute remained on the delay timer, and Copper was halfway down the stool again, flashing its Christmas lights for attention. The good doctor hauled him back up and picked another incoherent name from the call list. The remaining delay timer read twelve seconds as Benson dumped yet again. Grace pressed her phone against the booth window with Ron’s number dialed and waiting. The studio’s 3rd-place award fell from its hook and split to pieces on the cracked linoleum floor. As Copper flailed in the exit’s direction a cellophane eye popped loose. Benson held him back, wondering why his chaotic little robot wished to decamp. He flipped a mental coin. Chance pranksters a fourth time or face Ronald’s know-it-all smirk. He bit his lip and picked another name as the delay timer ticked into live time. Benson leaned back and exhaled, relieved to have a sane caller. Even the digital ants on his monitor had slowed down. Grace went back to swilling her label-free beverage. Copper, however, remained perfectly still and dark save for a whimpering vent fan. Benson yanked off his headphones as hellish roars and screams filled the feed. Grace cut the line and cycled in a round of advertisements for Mabel’s Country Kitchen: home of the roadkill special. He clutched his cell phone and ran outside for a better signal. The nip of snow flurries, a wash of pine trees, and a crust of splintered rock surrounded the mountainside work shed, aka radio station. Far below in the valley, Parma’s crosshatch of streetlights illuminated six bars, nine gun stores, and enough churches to cover consciences the morning after. Late at night, off-duty timber farmers gathered in bar parking lots. They stood around flaming barrels, drank discount slurry, and listened to oversized radios on the back of pickup trucks. Benson wondered if they listened to his show. Not tonight he hoped. He dialed Parma’s Police Department. The dispatcher came in through crackling static. Benson dropped the phone as a gigantic undulating mat of space metal descended upon Parma. Thousands of spiral mechanical arms filled the sky, dropping down through winter clouds. Illuminated by moonlight they swung like huge metal cables rippling through the ocean, propelling a central crystalline pod larger than a skyscraper. Within it stood the seething form of a giant more goat than man. The hundreds of mech hands planted themselves along the shaking mountainside, suspending the pod to hover closer and closer over the radio station. The pilot’s eyes were great orbs of fire bisected by horizontally slit pupils, focused with murderous intent on the speck of a man in a tweed jacket. Benson ran into the station. Grace was already gone. The cycle of commercials no longer played, and every screen cycled incomprehensible symbols. 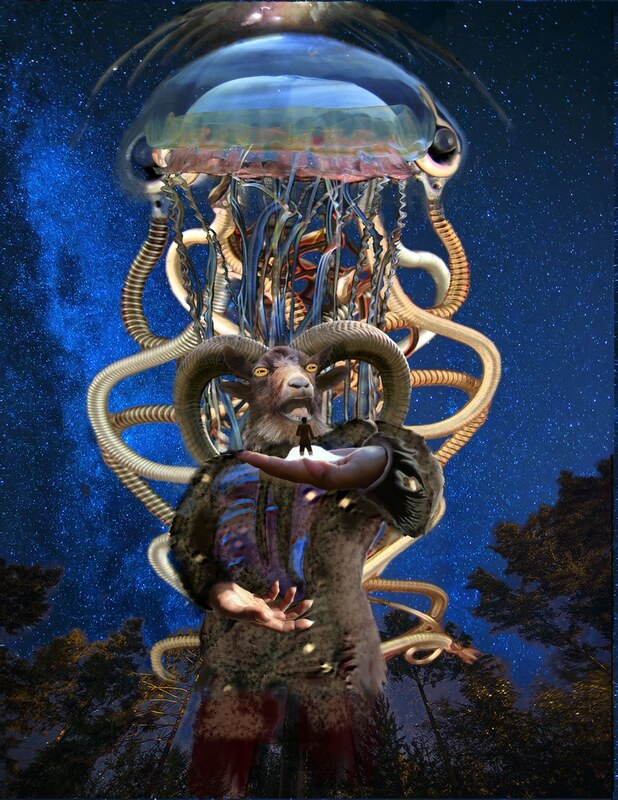 In the midst of the shaking, the technological hijacking, and the multi-limbed deathship piloted by Baphomet’s gigantic cousin, Copper sat limply on the stool swinging its arms. Benson picked up his co-host and dashed out the front door. One massive hoof came down right where the station’s parking lot – and Grace’s car – had been. The ground quaked, flipping Benson into the air and sending him rolling down the mountain. A giant goat hoof broke his momentum. Benson stayed curled into a ball, Copper tucked under his jacket, until the thunderous din subsided. 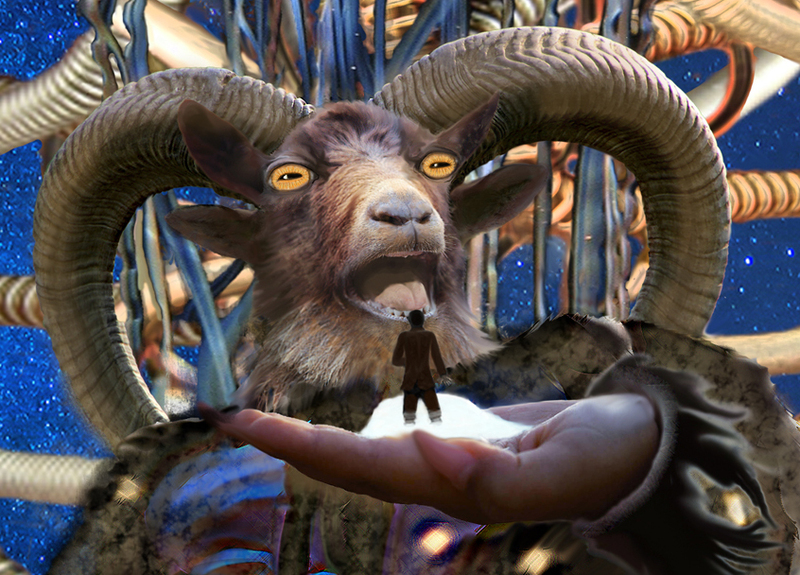 Shakily he stood, and looked up to find the goat man bending over him, his silhouette blocking the sky. Copper tried escaping the jacket, but Benson stuffed his cohost back out of sight. Illum snapped his jaws in earsplitting ire and the tassels along his horns rang a dire chorus through the valley. ‘Inn-Core-Wrecked’ shot from within Benson’s jacket. Benson’s hands shook as he lifted the toasterbot to eye level, silently pleading with it to back him up. He threw himself down the mountain before Illum could react. The James Bonds and John McClanes made it look so easy, but Benson Spicer clipped every rock and stump on his way down the slope. Illum stomped, and the shockwave popped him into the air. At the apex of his flight he spotted his trailer home at Parma’s edge, the football stadium PCC built instead of his robotics department, and the valley’s premier diner — Mabel’s Country Kitchen: home of the roadkill special. He landed in a giant snowbank as Illum’s massive hand scooped him up, snow bank and all, and hoisted him up among the clouds. Benson’s mind raced through the stacks of psych journals littering his trailer for a suitable placatory response. But despite all the preparation, blind confidence, and margin notes he had no answer for escaping an angry giant goat being from light years away. Copper – dented and sparking – blinked a Morse code of S.O.S. A retreat, a cry for help, a surrender for the first time in decades. Maybe it was the extreme height, or falling down a mountain, but his chest lightened as he repeated himself. Copper played a garbled celebratory tune and hugged him. With care, and his face away from the sparking bits, Benson returned the hug. Benson flinched under the booming echo. Illum looked down at him, his shaggy ears hanging, head tilted, trying to understand the oddity in his palm. “I made Copper to be my friend, my advisor, and I…I haven’t listened for decades,” said Benson. “But now Copper knows I know better and I want to change.” He tried to stay balanced in the giant furry palm as the alien weighed his words. Copper sparked as its remaining lights flashed in approval, and Benson coughed into his hand, embarrassed by the parallel. Illum turned about sharply and carried them to the ramp of his many-armed spaceship. In the valley below hundreds of doors and windows were filled with staring faces. Parma locals saw surges of neon light reflecting off Illum’s armor, and his voice rolled down the valley like thunder. Benson opened his mouth to protest, to cry fear for the horrors of space and impending death by giant hoof. But Illum carried them aboard his ship and commanded it to swim away as Copper blared mariachi music. Ron spun away from his console as his outro cracked into synth wankery. The PCC student technician waved for attention, a film of sweat on his forehead. Ron stomped into the tech booth. Every screen skittered with shifting jibberish. Ron slammed the booth door. The 3rd-place station award, held together by wood glue and hope, fell and shattered again. Ron kicked it and spun to the microphone. Jimmy ran from the studio and off into the forest, screaming his fear of hoof stompage. And as Ron crushed the splinters of the 3rd place station award into dust, from his hoverchair thousands of light years away Benson Spicer pressed the disconnect button. His office, a hollowed cyan crystal with luminescent furniture in Galactic Post-Modern, looked out over Kresge 07’s scintillating skies. Hundreds of spiring towers rose up through the clouds, flying the flags of the 293 space-faring civilizations allied to The Fifth Council. Sleek gleaming vessels slipped through the cloud layers like lunar octopi and whales. Animate holo-photos of clients lined the crystal sphere’s walls. Central were Illum and Allora, her magenta armor shimmering to scarlet as Illum rubbed horns with her. Other clients smiled and waved gratefully — Third Pit Lords breaking the habit of eating mates, enshadowed Seventh Priestesses breaking their hereditary engagements to dark star crawlers, Twelfth Legion warbeasts exploring the taboo subject of peace, a chitinous, eight-limbed aardvark analog longing to take a beach vacation. Copper rattled off congratulations in 293 languages, sonic, subsonic, and far ultra-violet. Jared VanDyke is a former radio show host who traded the airwaves for careers in creative writing and library bookkeeping. While his publication history leans towards sci-fi, he is readily available for collaborating on fantasy, horror, and investigative projects. You can find him prancing about Twitter @WriteVanDyke – where he regularly shares writing market developments.